It may be hard to see at first but your job is out there…and we'll help you find it. 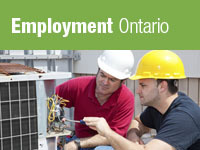 We're Employment Ontario and we want to help you get the training, skills and experience to achieve your goals. We want to connect people looking for work with employers looking for workers. That's why we're providing you with more ways to link to our expanding services.